Playing with Google’s StreetView… funny and somewhat scary! Five years into a national economic recovery, the share of Americans living in poverty finally dropped. But Kalamazoo and Flint are among the nation’s most impoverished cities. Kalamazoo’s poverty rate is among the highest in the nation and rising, according to new Census Bureau statistics, though its status as a college town is a factor. One in three Kalamazoo residents was living below the federal poverty line in 2006, according to figures released Tuesday. New category… old theme: I’m opening a new category on this blog called “Kalamatzo“! Who would have thought that? 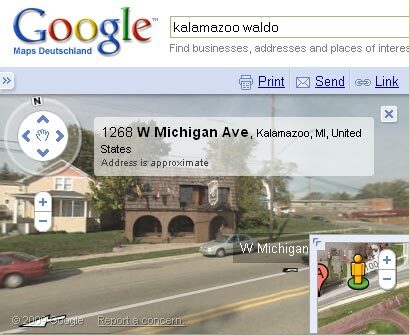 Here, I’m going to gather all the Kalamazoo related, useful and useless information that comes up on my travelings through the web… Mostly, this will concern my friends of 2000/01!